Peace Journalism is when editors and reporters make choices that improve the prospects for peace. These choices, including how to frame stories and carefully choosing which words are used, create an atmosphere conducive to peace and supportive of peace initiatives and peacemakers, without compromising the basic principles of good journalism. (Adapted from Lynch/McGoldrick, Peace Journalism). Peace Journalism gives peacemakers a voice while making peace initiatives and non-violent solutions more visible and viable. A number of valuable peace journalism resources, including resource packets and online links, can be found at www.park.edu/peacecenter. “Do not demonise North Korea. Demons do not negotiate. If there are no negotiations, there will be war.” These were the words of Chung-in Moon to journalists who gathered for the Korea Press Foundation journalism conference in Seoul, in October, as diplomatic efforts were being stepped up for a second summit meeting between Kim Jong Un and President Donald Trump. Moon is a sage old hand of arms control talks. A current member of the South Korean government’s advisory committee on diplomatic strategy, he previously served as Ambassador for International Security, combining these posts with his career in universities. His advice is timely, given the findings of new research on Australian media and how they refer to the Democratic People’s Republic(1). In coverage from two major newspapers and the public broadcaster, the ABC, North Korea was usually described as rogue, secretive, totalitarian or evil, with its leader “often referred to as a ruthless psychopath.” Dominant metaphors tended to be conflictual, framing the country as “a military threat [and] unpredictable, irrational and ruthless.” As the researchers comment, the pattern is typical, and not just in Australia. South Korean diplomat Chung-in Moon addresses the 2018 KPF journalism conference in Seoul. Jake Lynch divides his time between Australia, where he is Associate Professor of Peace and Conflict Studies at the University of Sydney, and Oxford, where he writes historical novels, acts in amateur theatricals and runs a local book group. Previously, Jake enjoyed a twenty-year career in journalism, with spells as a political correspondent for Sky News, and the Sydney correspondent for the Independent, culminating in a role as a BBC World TV presenter. For his work in Peace Journalism research, training and development, he was honoured with the 2017 Luxembourg Peace Prize, awarded by the Schengen Peace Foundation. In 2020, he will be a Leverhulme Visiting Professor at Coventry University. 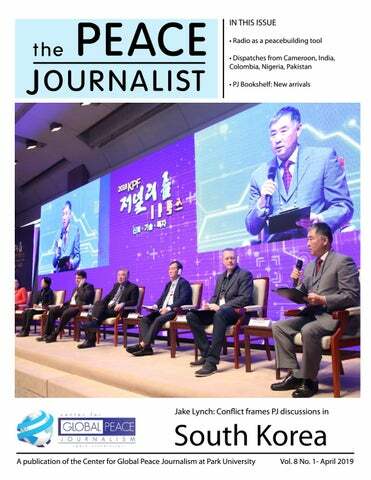 Prof. Jake Lynch discusses peace journalism at the 2018 KPF conference in Seoul. journal, Gandhi said, “It was never intended to be a commercial concern. So long as it was under my control, the changes in the journal were indicative of changes in my life...I cannot recall a word in those articles set down without thought or deliberation, or a word of conscious exaggeration, or anything merely to please. Indeed the journal became for me training in self-restraint, and for friends a medium through which to keep in touch with my thoughts.” (6) If we can practice peace journalism effectively, then the role of journalist is prominent. The above statement of Gandhi clearly mentioning the character and morality of a journalist is most important. And a journalist can work effectively if he can express and apply his soul through his words. oon is called “Towards a Peaceful Society.” Yet another is a radio drama entitled, “A Call for Peace.” Vojvoda commented that community media, like peace journalism, does not just give a voice to the elites of society but gives voice to the traditionally voiceless by presenting their views directly from them and not from someone who claims to represent them. He stressed that radio in the form of community media has great potential for peacebuilding. Youngblood, director of the Center for Global Peace Journalism at Park University, spoke next and took us to East Africa (Uganda and South Sudan) in his talk on Radio and Peace. He began by going over the 10 characteristics of peace journalism: 1. Being proactive 2. Uniting rather than dividing 3. Rejecting official propaganda 4. Giving voice to the voiceless 5. Being balanced 6. Providing depth and context 7. Considering the consequences of the reporting 8. Carefully choosing words to avoid being inflammatory 9. Selecting images that are not inflammatory 10. Debunking stereotypes, myths, and misperceptions. Youngblood discussed how he included these elements of peace journalism in workshops he led for radio journalists in Uganda. These journalists produced radio stories (the most important medium in Uganda) that incorporate these 10 characteristics. In one example, a public service announcement (PSA) sold the concept of a peaceful election. It used the tag line: “Everyone has a dream to live a better peaceful life this election. Choose Peace!” This PSA was played thousands of times throughout Uganda. There are many such radio stations in East Africa that have embraced peace journalism in their radio programs. any preconceived ideas on what stories they will find, and, of course, they give voice to the voiceless. Ron Jones, Director of Community Engagement and Laura Ziegler, Community Reporter from KCUR public radio in Kansas City spoke next on community engagement as peacebuilding. Ron Jones defined community engagement this way: “To learn the needs and aspirations of communities by examining issues that matter most to their lives. And to help people seek solutions to the issues facing their communities.” He stressed how they sought out new voices and perspectives to broaden their coverage of issues. As a result, they focused on serving underserved communities through their radio productions. This meant being engaged in communities beyond parachuting in to cover one-off stories. One prerequisite for this was to establish trust; otherwise the community would not engage with reporters. This involved identifying stakeholders in the community who were asked what the issues that they faced, and whom the reporters should talk to who could address the issues from the community’s level. With the stakeholders’ input the reporters then arranged listening sessions that took place in that community and were always off the record. Ron then shared an example of community engagement in their story based in Tonganoxie, Kansas. This centered on the plans of Tyson Foods to bring a chicken processing plant to the town – a plan that was supported by thenKansas Governor Sam Brownback. However, many in the town opposed the plant. Tonganoxie revolted against this plan, protesting most directly against the city council, who had notice of this but did not alert the rest of the town. Through their community engagement, KCUR’s story captured the variety of viewpoints reflecting the complexity of the issue. Another example was KCUR’s pursuit of stories centered on borders in the KC metro area. In this case, their community engagement resulted in a series of stories they titled “Beyond Our Borders.” They put in over a year to rediscover Troost Avenue (a traditional dividing line of segretation in KC), the State Line, the Wyandotte-Johnson county line (another racial dividing line), and the Missouri River. This in the spirit of peace journalism aims to dispel stereotypes perpetuated by Kansas City’s geographical and racial boundaries. The final speaker, Spencer Graves, board member of community radio station KKFI, gave examples of peace initiatives that have been broadcast by KKFI or disseminated on its website, including events and rallies by PeaceWorks Kansas City. The radio and peace session was part of the Greater Kansas City Peacebuilding Conference. This three-day event was hosted by Avila University, Park University, and Johnson County Community College from Oct. 25-27, 2018. (Far left)- KCUR’s Laura Ziegler discusses borderbriding stories produced by the station. (Left)Cameroon Community Media Network’s Rev. Geraldine Fobang and Alex Vojvoda connect with the conference via Skype. By Alexsandra Canedo The Gabriel García Márquez Foundation for New Ibero-American Journalism (FNPI) held its sixth Gabriel García Márquez Journalism Awards and Festival in Medellin, Colombia. In October in Medellin, Colommbia, conference panelists discuss photojournalism’s ability to nurture and heal societies. Cameroonian journalists meet in Bamenda to evaluate their efforts for peace. are important, they create negative peace, marked by the absence of violence. Social peace — known as positive peace — peace goes deeper, and can lead to true healing. IJNet delivers the latest on global media innovation, news apps and tools, training opportunities and expert advice for professional and citizen journalists worldwide. IJNet is produced by the International Center for Journalists in seven languages Arabic, Chinese, English, Persian, Portuguese, Russian and Spanish. Subscribe to IJNet’s free, weekly newsletter. You can also follow IJNet on Twitter or like IJNet on Facebook. Community radio stokes peace in Colombia By Emma Heidenreich I want you to imagine a dilapidated but colourful radio station studio, nestled in verdant Colombian jungle and protected overhead by a dense canopy. Inside, a man speaks into a microphone. He strategically omits his name from his broadcast for fear of an armed group active in a village nearby. Emma Heidenreich is a Journalism and International Relations Graduate (Hons. in Peace and Conflict Studies). Emma is a member of the TRANSCEND Network for Peace Development. She lived and worked as a journalist in Colombia at the height of the 2016 peace negotiations. Her research centres on engaging grassroots voices in conflict and post-conflict contexts. dangerous places in the world to be a journalist. The World Press Freedom Index situates Colombia at a dismal 130 out of 180 countries. At most risk are those journalists situated in rural zones, where clashes between armed groups and drug cartels are frequent. An overflow crowd is engaged by speakers at the Journalists Under Fire conference in December in New Mexico. cational and talkback programmes on community radio stations have, and continue to be, significant platforms. Rural consumers can access information, have an opinion on political and justice processes and hold Duque’s government to account. Evidently, these rural radio stations are key to peace because they are located where the majority of violence takes place, where international and even urban Colombian journalists rarely travel and where local people truly know and understand the causes and impact of conflict on their communities. This does not need to be a complex process. Rural communities have already laid the groundwork. They need recognition and support. Recognition that what they do makes a difference and support in one of the most hostile contexts in the world. --Originally published at: http://visionofhumanity.org/positive-peace/colombias-ruralradio-stations-key-peace/ and at https://www.transcend.org/tms/ . the Americans present enlightened and enriched both groups. I was privileged to moderate two exchanges with the international journalists. One exchange featured journalists from Ghana, Cote D’Ivoire, Cameroon, and Nigeria (panel discussion on misinformation), while another had reporters from Cameroon, Niger, and Nigeria (Citizen Exchange Circle). We discussed fake news and government propaganda; the double-edge sword of social media; the challenges of reporting about terrorism; and the state of media freedom in their respective countries. My breakfast and lunch chats with the visitors about their careers and their lives were equally enriching. Professionally, several journalists even indicated an interest in hosting me for a peace journalism workshop or project in their home countries in Africa, the Middle East, and Southeast Asia. I presented a breakout session where a lively group of about 50 gathered to discuss media coverage of migrants, and how peace journalism can be a tool to improve that coverage. In this session, after a quick examination of superficiality, negativity, and stereotyping coverage of Syrian refugees in European and Turkish media, we talked about how many of those same traits can be seen in recent coverage of the caravan “crisis.” I showed findings of recent studies that showed the threat was exaggerated by politicians, and that negative language was used far more than positive language about the caravan migrants. Finally, we discussed the way that the president used the media to spread his anti-immigrant hysteria. I said that peace journalism, conversely, would potray immigrants more three-dimensionally, and with a humanitarian angle. PJ would also reject the harsh, judgmental language we’ve seen so much in the media. I played several examples of peace journalism-style stories, including a terrific piece by NPR’s Scott Simon about a family separated at the border (https://www.npr. org/2018/08/11/637780548/how-separation-affected-amigrant-family). The audience pitched me some difficult questions to close out the discussion. Will audiences pay attention to PJ stories? (Actually, research shows audiences prefer PJ and solutions themed stories). How can we get media consumers out of their bubbles? (Not easy. Start with media literacy). Aside from my presentation, Journalism Under Fire featured a number of outstanding speakers, including Pulitzer Prize winners Dana Priest (Washington Post) and Don Bartletti (Los Angeles Times). Priest spoke about global censorship. Interestingly, she said that Facebook’s handling of news constitutes “a new kind of censorship” that promotes extreme views by giving consumers only the news Facebook thinks readers “want.” Photojournalist Bartletti showed his photo essays from the U.S.-Mexico border (including recent shots of a migrant caravan), and from Honduras. His photos were evocative: infuriating, depressing, and startling. Other JUF speakers included Ukrainian Olga Yurkova (fake news, Russia and Ukraine); Arbana Xhare from Kosovo (threats against journalists); Angela Kocherga and Alfredo Corchado (covering the U.S.-Mexican border); Nikahong Kowsar (the dangers of political cartooning in Iran); and several New Mexico journalists discussing their challenges and threats. Journalism Under Fire was organized by Executive Director Sandy Campbell and his staff at the Santa Fe Council on International Relations. Jason Rezaian of the Washington Post spoke at JUF and wrote about the conference in the Post. Rezaian noted that the conference was timely, since threats facing journalism are “one of the most consequential challenges facing free societies today.” I couldn’t agree more. Steven Youngblood is editor of the Peace Journalist Magazine, author of Peace Journalism Principles and Practices, and director of the Center for Global Peace Journalism at Park University, where he is an associate professor. To build peaceful and inclusive societies in today’s mediatized world, knowing how media can be a tool for conflict transformation, and a platform to promote inclusivity, is essential. Peacebuilding processes now increasingly include media-related practices and approaches to enhance their impact but focused higher education for students and practitioners in this wide area is lagging behind. The gap between the disciplines of Media Studies and Peace and Conflict Studies – in spite of efforts by scholars and practitioners around the world such as the Peace Journalist magazine – remains one of the major stumbling blocks. With a goal of building interdisciplinary knowledge among the peacebuilders of tomorrow about research and Saumava Mitra coordinates the new MA program in Media and Peace at University for Peace. He holds a doctorate in media studies from University of Western Ontario in Canada. Apart from his teaching, he researches on news media’s role in conflict with a special emphasis on visual imagery of war. At a peace journalism presentation (left); and at a panel of African journalists at JUF in New Merxico. Thrilled UPeace graduates last spring (right); and a view of the university’s bucolic campus near San Jose, Costa Rica. practice from both the fields of Peace and Conflict Studies and Media Studies, the University for Peace is launching a new postgraduate program called MA in Media and Peace. critical cultural studies related to media, political communication, international media law as well as critical understanding of contemporary digital media. The program at UPeace, which was established by the General Assembly of the United Nations, will begin in August 2019 and is meant for students who are interested in studying peacebuilding and conflict transformation from the perspective of media and communications. Current or wouldbe practitioners in the international humanitarian and peacebuilding fields who want to specialize in informationrelated interventions will find the program beneficial. Admissions to the program are open now. Partial scholarships for students from all signatory countries to the University for Peace Charter of the UN General Assembly (currently 41 countries), along with a few full scholarships, are on offer for prospective students. Those interested can find more information by visiting www. upeace.org. of political powers, even before the coming of the social media. Prior to the coming of the social media, basing political arguments on religion and ethnicity for winning of votes was minimal and it could easily be regulated. But with the social media, doing so has been amplified and has had negative effects on both educated and uneducated electorates. Some electorates, in many cases the young people, make uninformed judgment on a candidate or political party because of negative social media content. Added to this, electorates go as far as using abusive and inflammatory words to insult fellow electorates. Foreseeing this kind of incivility, the Nigerian parliamentarians some time ago proposed laws to regulate social media and to set up a media council commission. The both proposed laws have encountered setbacks because of massive campaign against them from the people, as a result of lack of trust in the government. Covering the peace movement forever changed me as a journalist. Sure, there were the soul-stirring sermons of the Rev. Martin Luther King Jr. as he led the Civil Rights Movement in the United States. His words and his speeches have continued to reverberate throughout the U.S. and the world. In my early years as a journalist both in college at the University of Missouri-Columbia School of Journalism, in the mid-1970s at the St. Louis Sentinel and in the late 1970s at The Kansas City Star, I wrote about Dr. King as the push grew to create a national holiday, honoring him. Also in my more than 39-year journalism career with The Kansas City Star (May 1977-October 2016) as a reporter, photographer, editor, columnist and editorial board member, I have had the privilege of interviewing and writing about other nonviolent, civil disobedience notables including the Rev. Fred Shuttlesworth, the Rev. James Lawson, the Rev. Joseph Lowery and Dr. John Swomley, as well as anti-apartheid South African Bishop Desmond Tutu. But the more lasting effect on my career and the writing that I continue to do as a journalist and author came from covering the peace movement from the 1990s, through the terrorist attacks of Sept. 11, 2001, and the protests against the U.S.-led, endless wars in Afghanistan, Iraq and elsewhere. I wrote articles showing how such shootings boiled out of the illegal drug trade, generating crime, the school to prison pipeline and prison industrial complex. Urban communities like Kansas City recorded the mounting tragedies in lives lost; people injured; grandparents, fathers, mothers, aunts, uncles and children either killed, injured or locked up; neighborhoods devastated by the families being split apart; and unprecedented numbers of black and brown people being traumatized. Yet these “victims” heard nothing but police sirens, “ghetto birds” as hip-hop artists labeled police helicopters, and politicians’ and everyday individuals’ cries of “law and order” justifying the all-out assaults on urban communities. Look at many inner cities now in the United States. It’s as if a war occurred, and the people lost. Those of all races who could, fled. Without the means, poor people had to stay. Segregation, as a result, is worse now than when Dr. King was alive. The news media largely turned to police, prosecutors, and other law enforcement officials for insight on the illegal actions and causes. But neither was enough. Keep in mind that journalism thrives on words of aggression and the controversy and conflict surrounding human interaction. The words include “fight,” “battle,” “violence” and “war.” We build motifs and stories around those and many other words of aggression and receive praise for such “good stories” that are published. Careers flourish or flounder based on the quality of such punchedup storytelling. Lewis W. Diuguid is an author, lecturer, diversity facilitator, and chair of the Political Action Committee of the National Association for Multicultural Education. own people and kill Americans, our plan may be to move on to Africa and free up another stone-age part of the world from warlords who have killed millions without Diuguid having expressed in writing any concern whatsoever! evil Satan, the NRA. Lewis, you must know it’s a lost cause. The NRA is a well organized machine run by white men with computers and guns and at the right hand of the president of the United States! What can a bunch of monkeys down from the trees hope to accomplish against such great odds? Now go have some more ribs and watermelon and don’t trouble yourself further. America is now in saner hands than the Clintonistas. You spear chuckers are back out in the cold on gun control. Please feel free to write many more columns on the subject at hand. You’re a laugh a minute now just as Rush Limbaugh predicted. It’s gonna be a painful seven years for you, Lewis, but the NRA is gonna enjoy every minute of it. faxes help explain how married people are to the language of violence, their outrage directed at anyone who dares question what they have been carefully taught and how they blend racism with violent language to make their point. And people wonder how Donald Trump got elected president? Change and the opportunity for a lasting peace will only occur when an arms and violence reduction happens in the literature and language used in our schools, colleges, news media, governments, and communities. We have to disarm how we speak to and about each other. Conflict won’t end. However, my hope is that people eventually will develop peaceful solutions to differences. Maybe then, gun violence will subside and more people will see the futility of owning and carrying firearms. With a new focus, ideas will surface prompting the world’s resources to expand, clean water for all life will be possible, poverty will subside and wars will become a thing of the past. It’s a lot to ask for. But it all begins with the language we use, explaining what we value, and at the top of the list must be the lives of all human beings. militaristic thinking that prefers hard power to resolve conflicts, while women often opt for soft power, which is the ability to shape the preferences of others non-violently. By Jo Dodd In the Democratic Republic of Congo (DRC), a country that has been mired in conflict and political instability for decades, radio is being used as an innovative and life-saving tool for promoting peace and dialogue and rescuing combatants from a life of violence. Centre Résolution Conflits (CRC) is a local organisation leading communityled peace projects across North Kivu, a province in Eastern DRC. information on violence and demobilisation in North Kivu. economic opportunities, she joined the Mai-Mai. “I saw other girls going to school and life seemed easy for them, they wore nice clothes and did not work like me. In 2007, I entered the bush and joined the armed group, still in search of a life.” Kadima learned to handle weaponry and became a skilled fighter. As she commented, “I shone in everything, because I was brave with determination.” However it was this determination and braveness that interested militia leaders, who abused and sexually exploited her. Jo Dodd is a Communications Officer at Peace Direct, an international charity dedicated to stopping wars and building peace. Previous to this, she co-founded and managed a non-profit enterprise, COLOURS of Edinburgh, which amplifies the voice of refugees. One of the most difficult tests media outlets face is whether to publish horrifying, gory images from crime scenes and terrorist attacks. Journalists covering a January, 2019 Nairobi, Kenya hotel-office complex attack recently faced this challenge. A January, 2019 NY Times photo, pixelated, showed victims of a terrorist attack in Kenya. 1. Are these images sensational? Are they necessary for a complete understanding of the story? In this case, the picture is clearly sensational, designed to shock more than inform. Certainly, there were many other less sensational photos that could have helped the reader understand the story without the gore. 2. Are there images the families of the victims would consider inappropriate? Should we consider their feelings before we publish? standard” in coverage of African victims that “goes against the ethics of journalism.” Whether we believe this or not, it’s important for Western journalists to keep this perception in mind and to report with more empathy and sensitivity. The New York Times says that it’s going to convene a group to come up with clearer guidelines for use of images in situations like this. Good. Let’s hope these guidelines include the principles of peace journalism. 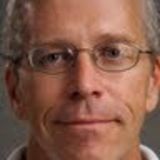 Steven Youngblood is editor of the Peace Journalist Magazine, author of Peace Journalism Principles and Practices, and director of the Center for Global Peace Journalism at Park University, where he is an associate professor. President of Pakistan Dr. Arif Alvi delivered his thoughts and personal experiences on media and conflict at ICMC in Islamabad. ism can be institutionalized both in the media industry and university level across Pakistan.